Bulgarian producer extraordinaire Strahil Velchev aka KiNK staying true to nature has released yet another triad of dance-floor burners with the release of ‘Chorus EP’ on the versatile Singapore based Midnight Shift imprint. Featuring previous cuts on the label from Eduardo de la Calle, John Heckle and the late Andreas Gehm, this is without a doubt going to be their best offering. Straight off the bat , the title track ‘chorus’ greets us with a graceful intertwine between a sh-101 bassline and a stab reminiscent of a 90s deep house tune . As the track builds and the filter opens up; the crunchy-stab explodes into euphoric goodness complete with raw saw-tooth motifs. 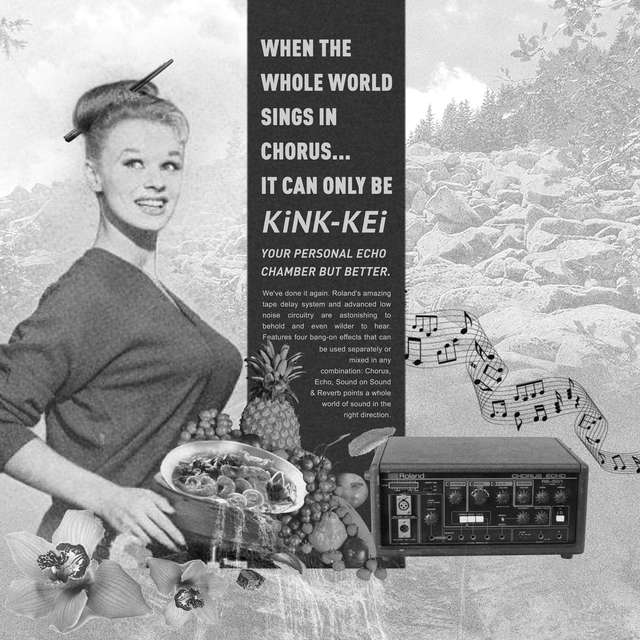 It is prudent to point out that KiNK manages to keep the listener intrigued without the presence of a prominent breakdown. The only one being filled in by his typical snare roll build up that leads into a smashing percussive bassline that’s going to get the sweat dripping off any dance floor. ‘Chorus’ is a track that came along out of testing hardware units. I bought a guitar pedal which was called Stereo Chorus Flanger, and I was just testing the sound and running some synthesizers through it. I found this nice melody, I pressed record… and that’s how the track came about! The second offering on the Singaporean imprint begins will a dull and drone-like pad , a deceiving precursor to what follows next. As a dusty kick comes in along with the usual claps and hi-hats the track reveals its true nature. An acid-laced, eerily dark and melancholic slider takes shape. The track squelches, squeals and winds it’s way into trippy obscurity as KiNK strips this track down to the bare bones. The drums aren’t fussy are and good enough to keep you hooked onto the track. In fact it compliments the omnipresent acid , which to me sounds like it’s picked up from one of his many 303 – clones. As we progress further into the predictive unknown , warm-ghostly chords chime in and rapture with dissonant simplicity rounding off another excellent piece of music from the Bulgarian maestro. The last track on the EP is another belter as it greets us with a delicious breaks – inspired kick drum with generous analog saturation to give it a touch of nostalgia. As you listen, the track grows onto you like the beginning of a great story. A lush-emotive pad swoops in enveloping the higher frequency spectrums. Suddenly you are shot-back in time to when detroit-electro was sending ravers into a tizzy. The track meanders into a gloriously blissful journey. Until two minutes in. KiNK tears the track apart to pieces but retains the key elements with audacious ease. The baseline erupts as a vicious , unforgiving saw-tooth lead rips the heart out of the peace that once was. Paying tribute to the 1983 classic, Cybotron – Clear , there is no questioning this man’s roots. Throughout the experience , KiNK demonstrates the prowess of his production capabilities with arrogant impetus as he draws the listener in and out of contrasting vibes like dipping elegant green tea bags into hot-water. KiNK also has a surprise in store for all vinyl aficionados, offering four original loops that are distinct from the entire EP. The electro-inspired loops are designed to be used as tools and can be layered over a variety of sounds. Glitchy, off-beat and tastefully construed , the serious DJ can certainly find space for dropping any of these in their sets. KiNK reflects the workmanship of his live sets. Effectively divided into both the musical and technical domain and his artistic abilities. These immensely hypnotic looped tracks, offering listeners an insight into the mastermind's intimate attention to detail.